Combineer twee geweldige tours voor een uitgebreid overzicht van de stad San Antonio. Geniet eerst van een ontspannende 35-minuten durende bootcruise langs de rivier de rivier de River Walk. 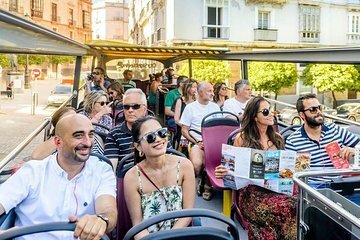 Ontdek vervolgens de populairste bezienswaardigheden in San Antonio met een mooie hop-on hop-off, dubbeldekker bus tour. Bezoek populaire sites zoals de Alamo, Pearl Brewery, het San Antonio Museum of Art, Market Square en nog veel meer. Selecteer een pas en stap dan in bij een van de 19 haltes om de stad op maat te leren kennen, met live, aan boord gesproken verhaal. We use Viator often and always have great results. We had two different drivers one was really good, customer driven - The second was ok but no awards. He really doesn't like customers to wave for him to stop--claims he is not a 'dog' so they simply need to raise a hand - not wave. He announced this to the bus before the customers boarded but then reminded them not to wave for a stop? I was a bit bored with this tour. I'm not sure if it was because so many streets were closed for the Final Four so we didn't take the usual tour, or if we didn't have a good driver. Had a fun day hop on hop off and then a boat ride too. Great day. This was our 2nd trip to San Antonio this year and our 1st time on this tour. It was excellent. We felt that most of S.A.'s downtown points of interest were pointed out to us. And withal day to tour, get off when we wanted and back on when we wanted, we felt in charge of our schedule. Our tour guide was friendly, courteous and knowledgeable, as were the ticket agents we initially talked with while buying our tour tickets. All in all, a success experience. Our early morning riverwalk cruise was informative and pleasant, with very few of us on the cruise at that early hour. The hop on/hop off tour was most awesome for the variety of sights to see and the reliable transportation to some of San Antonio's best shopping experiences over 2 days. The hop on hop off bus trip was good - not a lot of things to hop off for but a nice way to see the city. The river walk cruise was very busy and the sound system on the boat was not up to par at all. We went at dusk and the river walk was very crowded. Be prepared for lots of commercials or advertisements of various businesses you will pass. However, it is a great way to get a tour and see places you might like to visit. The River Walk cruise was very good with the Captain of the boat giving us lots of information about the things we were seeing. It was very crowded and hot but all in all a good boat ride. The Hop-on Hop Off tour was a complete disappointment. The mesh screens covering the bus windows made it almost impossible to see out and see what we were driving by. It was incredibly hot inside the bus - very uncomfortable. Our driver tried to be amusing but he thought he was funnier than anyone else did. Of the 18 stops promoted on the tour, several were just hotels for dropping off and picking up. The only thing we actually got off to see was the Hemisphere Tower and then had to wait almost 20 minutes for the bus to come back around. This is not a tour I would recommend. It was confusing and difficult to find where to pick up our tickets, and where to board the cruise. The cruise itself was fine, a great way to see a lot of the canal. The boat was over crowded, uncomfortable, and hot. The tour guide gave us some information, but he was difficult to understand, so we stopped listening.